The solution was to retrofit over 10,000 square feet of glazing with a new dynamic glass material that automatically tints when exposed to the sun. The material is incorporated into SageGlass’s thermally calibrated units via three zones within a single pane of glass to help establish a more balanced distribribution of daylight. Similar to eyeglasses that passively tint when exposed to daylight, dynamic glass is an electrochromic glazing that is integrated with a building management system. The units have the the ability to automatically tint, and also tint “on demand” when requested by room occupants. For instance, in Warwick Geneva, meeting rooms will often use this function during video projection presentations. 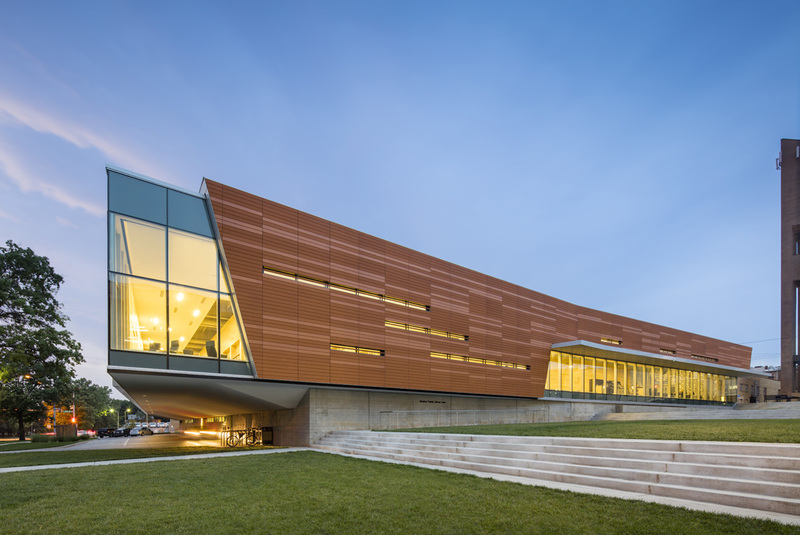 The facade intelligence allows the building envelope to maximize daylighting while reducing heat and glare, and maintaining views outward. Alfonso-Agustín González García, architect at dl-c, designlab-construction, a Swiss-based firm, said dynamic glass was a material familiar to the office but was introduced to the project from the client. The architects worked around existing precast concrete “portal” shaped panels, detailing the replacement windows. This process led to a more vertically oriented proportioning system. The installation process was celebrated as an “efficient and flexible” process by Alain Rigazzi, director of the hotel, “Thanks to the new SageGlass facade, our guests benefit from a very effective thermal and acoustic insulation. 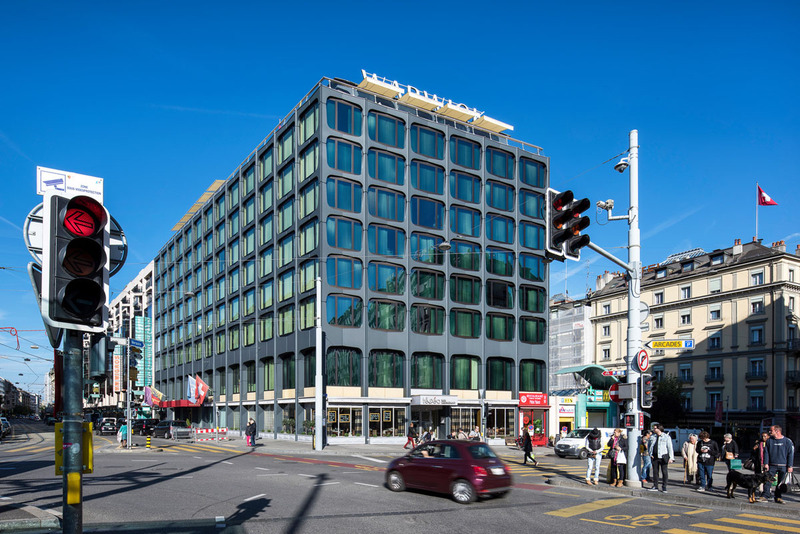 The efficient and flexible installation process allowed us to complete the renovation without ever closing the hotel.” The thermal performance of the replacement window units is expected to allow the building to meet Switzerland's contemporary energy regulations. The retrofit has contributing to reduced heating and cooling costs, while satisfying owner desire to re-establish a visual connection to the surrounding context. CHYBIK + KRISTOF, a young Czech Republic–based firm led by two founding partners who have both been included on Forbes' “30 under 30” list, has recently completed a renovation of an existing car showroom to a furniture gallery for MY DVA, a company focusing on the development, production, and sale of office, school, and metal furniture. 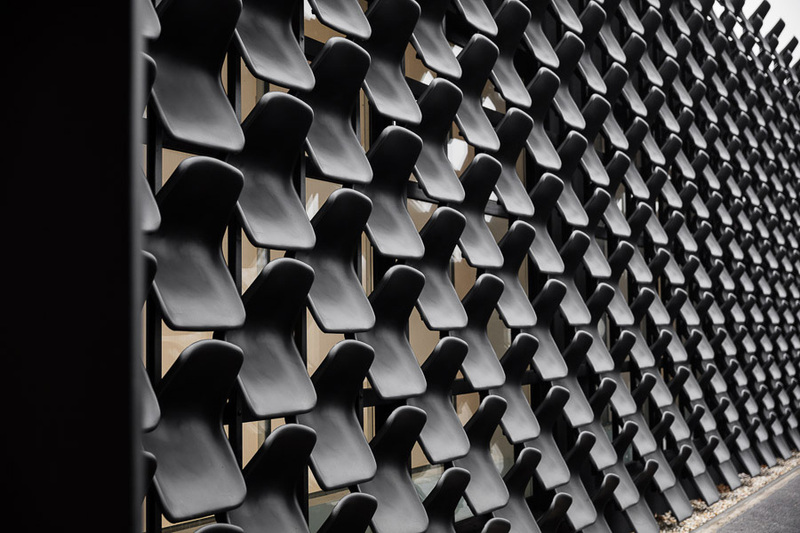 Facade Manufacturer MY DVA group a.s., Stavitelstvi Kroutil s.r.o. Facade Installer Stavitelstvi Kroutil s.r.o. Products Vicenza Chair by MY DVA group a.s.
After sitting vacant for nearly 20 years, the eight-story Metropolitan Water District office tower in Los Angeles’ Echo Park neighborhood has been converted by David Lawrence Gray Architects from an office building to a luxury residential tower. 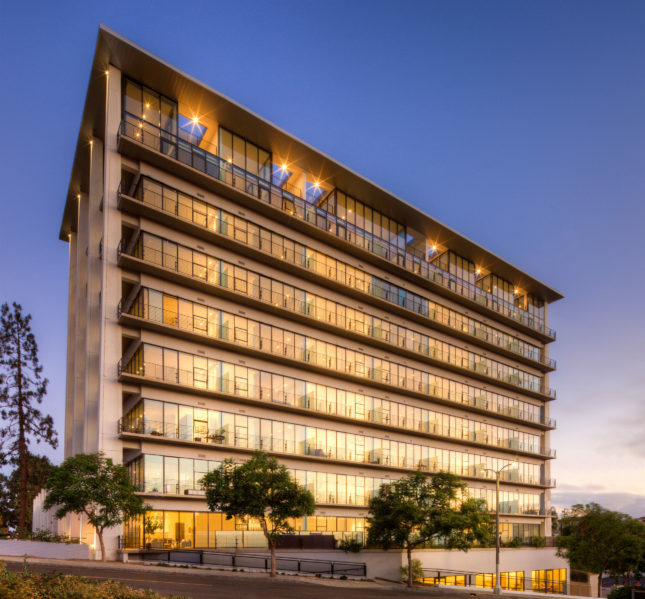 The original building was designed in two phases by famed modernist William Pereira – a low-rise podium, and high-rise tower – through a process that spanned 12 years, from 1961-1973. Pereira’s design was structurally expressive concrete frame building, with cantilevered exposed concrete slabs establishing a wrap around balcony on each level. The primary bays of the building along the longitudinal axis are expressed at the ends with infrastructurally-scaled white concrete columns, while perforated concrete panels formed an iconic modernist brise soleil along the podium. Named after an ancient Greek conception of heaven, The Elysian blends architectural modernism with contemporary luxury living to produce 120,000 sq. ft. building with 96 Live/Work Units. Pereira’s original building was, at times, carefully and respectfully restored by the project team. This is evident in the clean-up of Pereira’s concrete columns, which contained – under decades-worth of grime – a high quality quartz aggregate cast (much to the surprise of the team). Another preservation marvel is the restoration of the existing mullions on the building. Metal panels from the lower third of the opening were removed along with original glass panes. The steel mullions were grinded down and repainted. The openings were replaced with new double-paned coated glass and micro shades to produce a new building envelope. The architects worked with CRL-U.S. Aluminum to integrate an operable window unit and patio doors within Pereira’s mullion layout. Also notable is the detailing of the new steel railing which translates an original post spacing cast into the slab with a new horizontal assembly providing technical precision of steel without visually overpowering the building envelope. While this renovation project makes historical acknowledgements to Pereira’s modernism, the new work to the building tends to give way to necessary market demands of luxury residential living: amenities like floor-to-ceiling windows and a two-story penthouse addition subtly transform the modernist building into something more “transitional.” The penthouse addition is carefully designed, but produces the most deleterious effect on Pereira’s proportioning system. 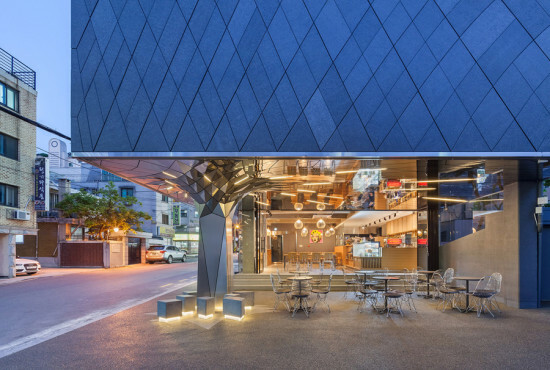 His primary columns, once soaring optimistically beyond the body of the building towards the heavens have now been capped by a stealthy new addition which the project team has skillfully blended into the aesthetics of the original structure. Here, the curtainwall system, thermally improved by a continuous thermal spacer that is interlocked within pressure plates, is a sophisticated update to Pereira’s steel mullions. The system picks up where Pereira’s mullions left off, set in alignment with the mullion spacing throughout the building, and color matched with the rest of the building envelope. However, the 20-foot penthouse heights require an unfortunate and unavoidable heavier thickness. There is something interesting about juxtaposing a thermally sophisticated modern curtainwall system against steel profiles of the 1970’s. The two-story penthouse addition works to creatively conceal a rooftop mechanical space housing condenser units and a photovoltaic array for solar hot water heating. Also, the existing building was design with a generous floor-to-floor dimension of approximately 13 feet, allowing for an adaptive reuse of the building with minor modifications to the slabs required. New residential units were efficiently stacked by the project team, allowing for an economy in utility distribution, and limiting slab penetrations between floors to simply a new shaft and stairwell. Historians might argue for removal of the penthouse entirely, while environmentalists might argue for a full replacement of the original mullion system. Regardless, occupants of the building – especially those in the upper floors – will surely take delight in the 360 degree views of Los Angeles’ distant hills and sprawling low-rise cityscape that Pereira, and now David Lawrence Gray Architects, have provided. Icelandic Borders. Today at 5PM, "the largest temporary public art exhibition... in New York City Parks history," titled BORDERS, will be unveiled at Dag Hammarskjöld Plaza. 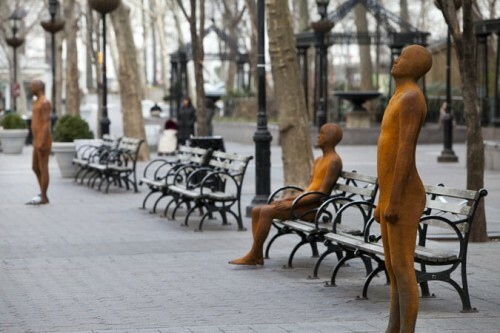 The UN-conscious installation is a collaboration between the Parks Commissioner, an Icelandic Ambassador, and Icelandic artist Steinunn Thórarinsdóttir, consisting of 26 androgynous, life-size sculptures. Painted Trees. Gerry Mak of Lost at E Minor adoringly shares the curious images of the vibrantly painted trees around Colorado by artist Curtis Killorn. Because of the unexpected colorings, these trees do not look like they came from land, but from the sea. Green Carnegie. We were worried when gbNYC reported that the good ol' Carnegie Hall is planning to undergo a massively ambitious, full-spectrum retrofit this year. But don't worry, the architecture firm Iu + Bibliowicz, which is in charge of all this, swears to preserve "the building’s distinctive 19th-century architectural grace notes" while making dramatic green building improvements. Parking to parkletting. The SF Examiner reports that more temporary public spaces, called 'parklets,' are exploding throughout San Francisco parking spots. The public battle between those who want to park cars and those who want to seat customers out on the sidewalk seems to have a clear winner-- the Department of Public Works is stamping out countless approvals for businesses to have their own parklets despite complaints.